Newsletter March 2016 - Your Drawers - Kay Kan! How I want to get in your Drawers! Have you heard that Cleanliness = Productivity? The majority of Texans have probably heard that ‘Cleanliness is next to Godliness’ . Look around right now at your work space, is it an area that helps you be productive? Despite the excuses that some will give, piles are NOT organization. Here are some ideas that may be helpful moving you from ‘messy’ to organized. You may have more room to organize your work than you think. Look around you – are you using your vertical space as well as your desktop? Bulletin boards and overhead shelving are great additions that don’t take up any square footage. Look under your desk – is there room for a rolling file cart to store documents? A little imagination will go a long way to adding organizational options to a small space. Gather the materials that you refer to frequently throughout the day; directories, lists, catalogs, schedules, prices and keep them all in one easily accessible place. Group items by the way you will look for them, such as suppliers in one group, customers in another. Assign a different colored folder to each group. Write the name of each type of folder/reference on the tab. Go through your piles (a little at a time if necessary); De-clutter, empty, shred and get rid of everything that you don’t need or want. Do you need all those knickknacks on your desk? You don’t have to go to the extreme of creating a sterile workspace, but if you are not using it, move it off your desk. Order your folders alphabetically within each color group. Designate a Physical Inbox – We all have too many email inboxes, yet many people no longer have a physical one on their desk. Regardless of ‘going paperless’ there are still documents that you will receive in paper form. Therefore, you need one place for incoming papers to reside prior to your review and processing. I suggest that if you don’t need something in hard copy, then stop it from coming to your desk. That pile of magazines can be placed in patterned file holders and place in your book shelf or storage area. Or better yet, rip out the magazine article you want to read and either file that paper document for READING MATERIAL or scan it give it a title that includes the name of the article, the magazine or news publication, and the date and then file under READING MATERIAL or ARTICLES to READ. Once you have read the article decide to save in a different file folder or send to the recycle bin. Have a Trash Can Within Reach –Never put trash down on your desk. Make sure that you can easily and quickly reach the trash from your chair. 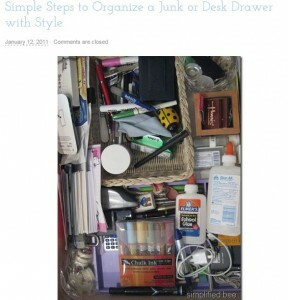 Designate a drawer or folder of Current Projects and/or Things that Need Attention. Position the accessories near your computer within easy reaching distance. Prioritize your shelf or bookcase items and find storage containers or new covers for ratty looking items that you use frequently. Take a Picture – Do you have items on your desk that are simply for reference? A battery or ink cartridge that you need to replace? Instead of leaving these items on your desk, take a picture with your smartphone. You will be more likely to have your phone with you when you need to reference the item. Scan It – The price of a scanner is worth the peace and organization it will bring! Clear that paper clutter, by scanning it into soft copy or PDF. When in Doubt, Throw It Out – You will never need 99% of the papers that you are saving. When in doubt, throw it out. If you truly need a hard copy, make sure you have a filing system to put it where you can locate it in the future. Refer to February’s K-Kan Newsletter for specific documents you are required by the IRS to maintain. Clean It Before You Leave It –One of the best times to clean your desk is the end of the day. It brings closure to your work day and sets you up for a clean start tomorrow. Next Month = Spring Cleaning Checklist, hints to increase efficiency & April Shred dates!